South Korea and Australia could be attractive options for Southeast Asian states looking to boost naval capabilities. The members of the Association of Southeast Asian Nations (ASEAN) are currently engaged in developing naval strategies and modernizing their navies. This presents opportunities for both the Republic of Korea (ROK) and Australia to build special complementary relationships with ASEAN members as they seek to improve their defense-industrial capabilities. There are several pertinent questions to understand first. Why does ASEAN need naval modernization? Why does ASEAN require special complementary relationships with Asian partners, rather than with the United States or the European Union? Why should the Southeast Asian nations look to the ROK and Australia for help, rather than China? What can the ROK and Australia offer to meet the requirements of Southeast Asian naval modernization processes? What are the benefits to ASEAN, and to the ROK and Australia, in sustaining a close naval relationship? ASEAN’s defense-industrial capabilities are expected to see a boost from centralized military procurement and expanded cooperation on developing affordable new naval weapons and systems as part of their naval modernization programs. The recent conspicuous expansion of the People’s Liberation Army Navy (PLAN) in the sensitive seas of the region, most obviously in the South China Sea (SCS), has prompted a general reform of national defense industries, with the emphasis on consolidating and centralizing fragmented defense industries, establishing self-sufficient domestic industrial capabilities, diversifying R&D investment, pursuing defense cooperation agreements, and jointly developing or acquiring next-generation assets. Achieving these aims will require ASEAN members to coordinate their defense policies and also to collaborate with other regional states, which presents significant challenges. ASEAN members disagree on defense procurement policy: some prefer Asian partners and others want to look outside of Asia. Facing the urgent need to deal with a perceived maritime threat from China, the choice of partners to enhance Southeast Asia’s defense-industrial capabilities impacts national sovereignty as well as national security. Some ASEAN members would like to demonstrate their freedom and independence to cooperate with whichever partners they choose, but others fear that diversification could undermine their long-standing security partnerships with the United States and Europe. To integrate their defense-industrial programs with their national security priorities, ASEAN members have to balance geopolitical factors against their need for affordable defense capabilities. The Southeast Asian states thus face a choice: Is it more important to maintain historical relationships with Western defense suppliers, as part of a broader geopolitical alignment with the West, or should ASEAN members seek defense-industrial cooperation with the middle powers of the region? The latter option would allow for an emphasis on capability-based defense-industrial cooperation, and there would be significant economic advantages accruing from a common security and defense policy at the national and regional levels, with high-quality technology-based jobs and potential spin-offs from military investment. National sovereignty issues are also reflected in a desire to pursue a distinctive “Asian way,” with some aspiring to an Asian echo of Europe’s “ever closer union.” All agree on the need to deter the threat from China, but ASEAN members remain split on which defense partners would best achieve this aim. If ASEAN members are ready to change their mind-set by shifting their defense-industrial cooperation from the United States and Europe to the middle powers of the region, then the best available partners for affordable naval modernization are the ROK and Australia. Both countries have sophisticated R&D capabilities, strong and supportive foreign/naval policies, and are capable of large-scale naval production programs. Collaboration with the ROK and Australia offers many advantages: rich cultural interactions with ASEAN members including appreciation for “Asian values,” timely replacement of older naval assets, competitive pricing, reliable and transparent naval acquisition processes, and the prospect of future defense-industrial development and ensuing spin-offs from naval modernization. The ROK Navy (ROKN) and Royal Australian Navy (RAN) have long been recognized as agile and effective naval forces, with considerable experience of maritime security cooperation with other partners, including the U.S. Navy and the Japanese Maritime Self-Defense Force. Their multinational naval cooperation has been demonstrated in maritime security exercises and also in responding to regional maritime emergencies requiring search and rescue, humanitarian assistance, and disaster relief operations, often collaborating with the PLAN. They are now seeking to further develop their roles as established strategic middle powers in the Indo-Asia-Pacific region. They are widely admired for their cooperative strategic approach, and have made great efforts to remain on friendly terms with both the United States and China. In this South Korea and Australia are role models for many other countries in the region, which are hoping to avoid having to choose between the great powers. It is natural for the ROKN and the RAN to sustain close interoperable partnerships with the Southeast Asian navies of Indonesia, Malaysia, Singapore, and the Philippines. Some of these countries participated in the United Nations Forces that fought in the Korean War against North Korea and China. ASEAN members have already benefited from coastal patrol vessels supplied by the ROKN and the RAN to enhance capabilities to resist Chinese maritime assertiveness in the SCS. There are also broader collective advantages accruing from developing a complementary relationship between ASEAN members and the ROKN and the RAN: naval modernization is a useful stepping stone toward realizing a much wider range of shared interests. The ROK and Australia have an opportunity to build a regional system of defense-industrial cooperation that can last for decades, developing skilled workforces, advanced manufacturing bases, and military technological capabilities. All these factors will facilitate entry into the global supply chain of the defense industry, and the ROKN and the RAN will be simultaneously working with ASEAN for the common security of the region. Indeed, bilateral defense- and naval-industrial cooperation is already expanding. For example Daewoo Shipbuilding and Marine Engineering (DMSE) and Hanjin Heavy Industries are working with Indonesian domestic shipyards to build Landing Helicopter Docks and submarines. Nevertheless, even with closer bilateral naval industrial cooperation between the ROK and Australia, and between these countries and ASEAN members, serious challenges will remain. The best way for the ROK and Australia to meet these challenges is to focus on capability-sharing defense cooperation rather than on competition. Since they both have an essential domestic requirement for new weapons and systems to be interoperable with the U.S. military, this is another reason for them to cooperate. A common standard of interoperability can then become another factor, on top of affordability and quicker delivery, to help the ROK and Australia persuade political factions within ASEAN that are reluctant to move away from their established U.S. and European suppliers. The ROK and Australia should cooperate to provide a defense and naval cooperative framework for ASEAN members, transferring high technology to support their defense-industrial programs and to boost indigenous defense-industrial capabilities. Such a complementary defense and naval partnership between the ROK and Australia could form the cornerstone of a closer regional defense and security relationship into the foreseeable future. Although the ROK and Australia can provide naval and coast guard assets that are cheaper and more specific to ASEAN’s requirements, this is unlikely to be a game-changer in the maritime disputes between China and ASEAN, nor will it provide much impetus for a transformation of the regional maritime security environment. China continues to destabilize the maritime good order of the region, and the best option for improving maritime security is surely to establish broader networks of maritime cooperation between the middle powers of the region and between these and the weaker powers. 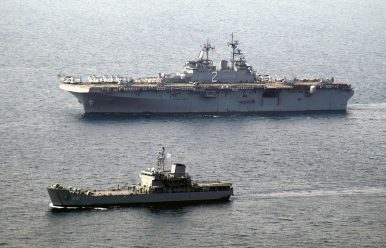 Concrete suggestions to bring the ROK and Australia closer include: developing common goals for networked defense-industrial cooperation at both the policy and operational levels through “2+2 Talks” between the foreign and defense ministers, “Navy-to-Navy Staff Talks” between the ROKN and the RAN, holding pol-mil games and conferences, maintaining interoperability between the two navies to facilitate joint naval cooperation, forging links between military or civil defense attaché officer’s networks, and pursuing defense coordination between government-sponsored and civilian-owned defense companies. Of course, the ROK and Australia should be simultaneously seeking to deepen their relationship with ASEAN. Sukjoon Yoon is a retired navy caption in the Republic of Korea Navy (ROKN) and a Research Fellow of the Korea Institute for Military Affairs (KIMA). When Will the Philippines Get Its New French Vessels? A closer look at a deal that is set to be realized soon.